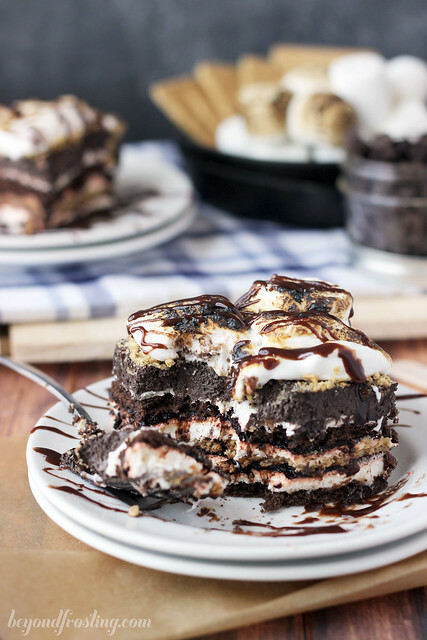 This S’mores Lasagna Cake is such a fun icebox cake, every layer in a new surprise. 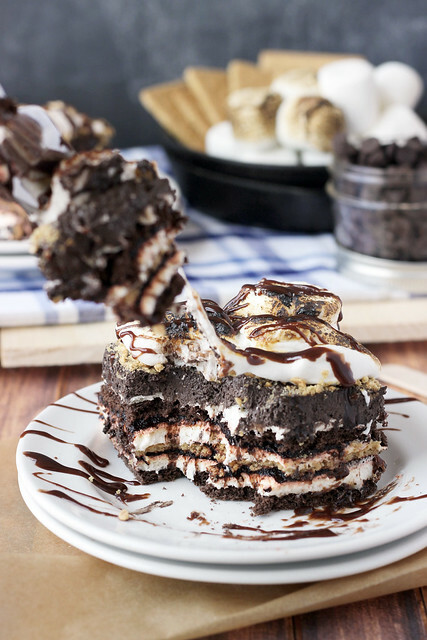 Layers of graham cracker, chocolate whipped cream, toasted marshmallow mousse and pudding. It’s all topped with more toasted marshmallows! 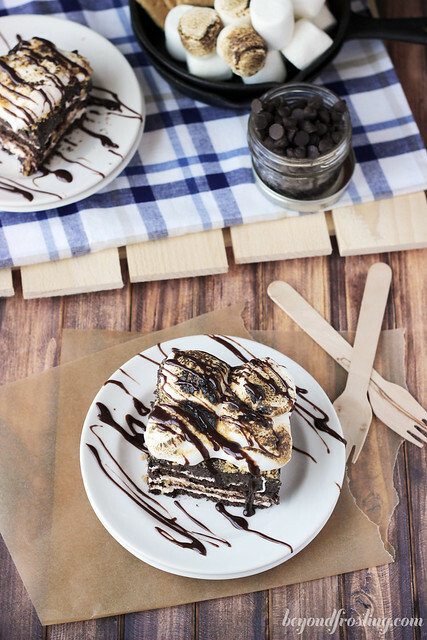 Try this no-bake icebox cake today! Welcome to S’mores week! A few of us bloggers decided we needed something to make the end of the month a little bit more exciting. As a dessert blogger, my head is pretty much filled with sugar thoughts all the time. So when Lisa asked me to join, you know I was on board. I am really excited to see what everyone came up with! For day one of S’mores weeks, I made S’mores Lasagna. You know I love me some lasagna, especially when it consists of chocolate, whipped cream and marshmallow. For my lasagna, I used both chocolate and regular graham crackers. 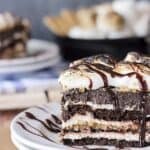 The other layers include chocolate pudding, a marshmallow fluff cream and chocolate whipped cream. Each bite of this dessert offers a unique taste experience. It starts at the top with toasted marshmallows. I used a combination of a microwave and kitchen torch. The microwave helps soften the marshmallows and the torch toasts them. Under that I made a chocolate whipped cream with a dark chocolate cocoa powder. You can of course make a regular whipped cream or use Cool Whip. 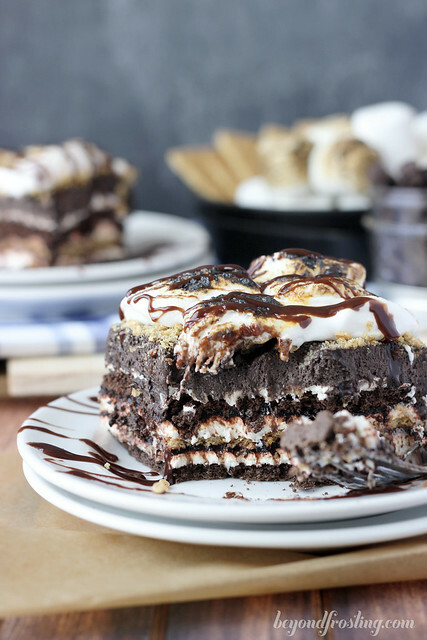 I just like a little bit of extra chocolate on my s’mores, don’t you? First you need to prepare some instant chocolate pudding to allow it to set. While you are waiting, combine the marshmallow fluff with some marshmallow cream and a few toasted marshmallows. To assemble, you simply alternate layers of graham cracker, with the marshmallow fluff, and a little bit of pudding. The longer you let it set, the softer the graham crackers become. They take on a cake-like texture. The lasagna is easy to cut into and holds it shape nicely. Before you get too confused by the math, divide your marshmallow fluff into thirds and your pudding in half. There are three layers of graham cracker and 3 layers of fluff, but only two layers of pudding. Finally, one layer of whipped cream and marshmallow on top. Did I confuse you yet? I hope not! Let’s go get our s’more on. Be sure to check out what all my friends are making at the bottom of this post! This recipe can also be found in my cookbook, No-Bake Treats. Star by mixing the instant chocolate pudding with milk. Whisk until pudding mix is dissolved. Refrigerate until firm; about 10 minutes. In a mixing bowl, combine the Cool Whip and marshmallow crème. Beat until smooth. Using a heat proof bowl, microwave mini marshmallows for 10 seconds. Use a kitchen torch with a low flame to gently toast the marshmallow. Beat into Cool Whip and Marshmallow crème mixture. Line a 9×13” pan with tin foil or parchment paper. 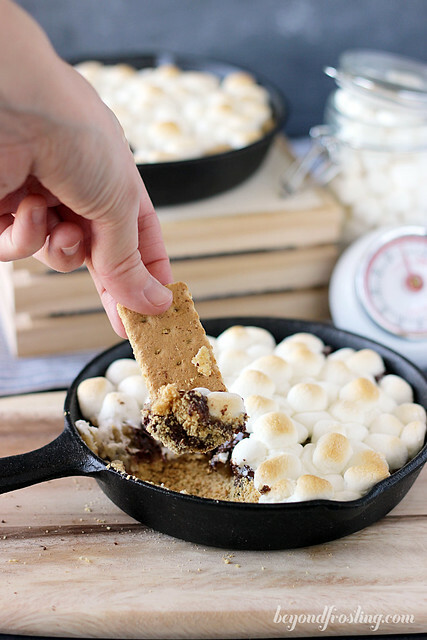 Lay down a layer of chocolate graham crackers on the bottom of the pan. Try and cover all edges evenly. Do not break apart the larger pieces until you need to fill in the cracks. 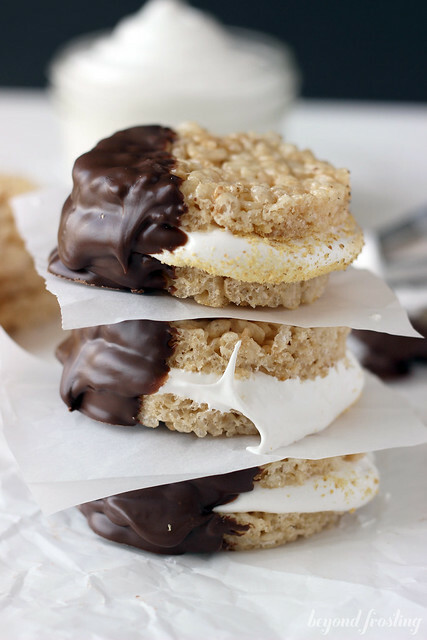 Take ⅓ of your marshmallow Cool Whip and gently spread over the bottom layer of graham crackers. Next spread half of the pudding mix onto the top of the marshmallow Cool Whip. Make the next layer using regular graham crackers. Try and cover all edges evenly. Do not break apart the larger pieces until you need to fill in the cracks. Take another ⅓ of your marshmallow Cool Whip and gently spread over this layer of graham crackers followed by the remaining pudding. Make the next layer using chocolate graham crackers. Try and cover all edges evenly. Do not break apart the larger pieces until you need to fill in the cracks. Use the remaining marshmallow crème mixture to gently spread over the top of the chocolate graham crackers. Make the chocolate whipped cream by using a stand mixer. Beat the cream on med-high for a few minutes until bubbly. Add 2 tablespoons of powdered sugar and 2 tablespoons of sweetened cocoa powder. Beat until stiff peaks form. If the whipped cream is too bitter, add an additional tablespoon of powdered sugar. Spread whipped cream on top of the last layer. Refrigerate for 2-4 hours to allow each layer to set. 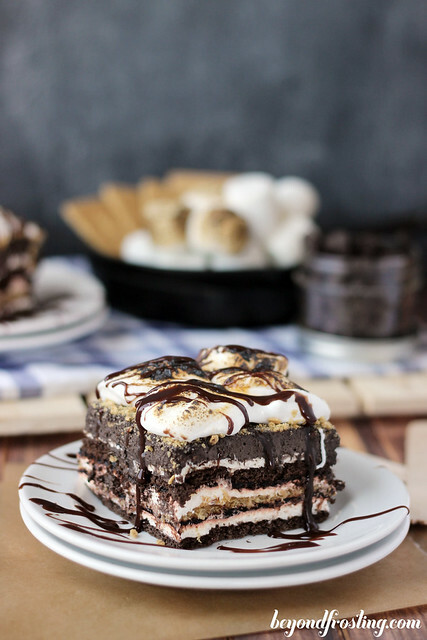 You can top the lasagna with a layer of toasted marshmallows if you desire. Use a piece of parchment paper or microwave-safe plate. Microwave in groups of 10 for 10-15 seconds until soft. Move them with a knife onto the top of the lasagna. Use a kitchen torch on low flame to gently toast the marshmallows. 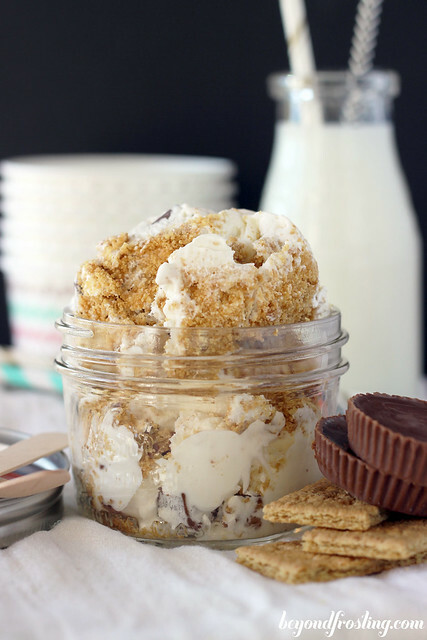 Drizzle with hot fudge and leftover graham crackers crumbs. Oh man, I really love this! 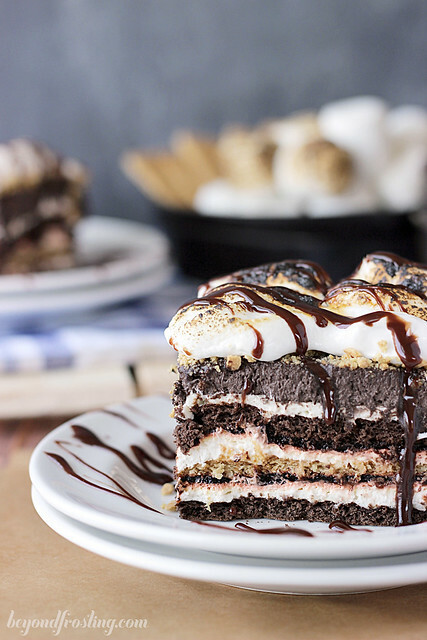 I love all of those layers and those gooey marshmallows on top! 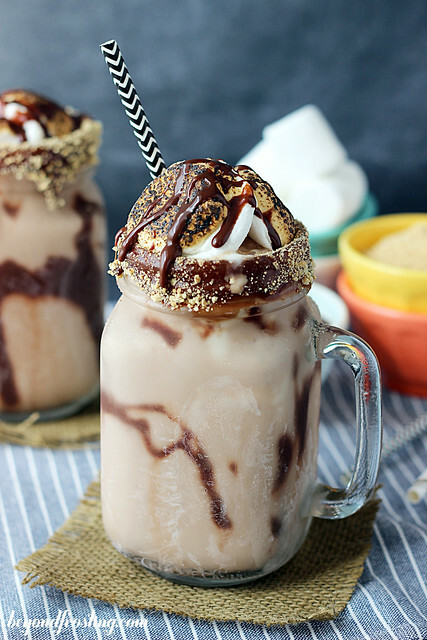 Really loving all the s’mores week recipes! Thanks Julianne for a great post! What!! That’s amazing! Love this so much! i would like to make this recipe but i could not find how many servings is in this recipe. Also the nutritional info for this recipe. Hi Cindy, I do not actually provide nutritional information for this recipe. This is made in a 9″ by 13″ pan, so you you can slice into 12 or 15 slices. Thank you!